Have you ever felt mentally exhausted? In other words, you cannot deal with one more thing? Or, do you find yourself being unable to pay attention, making simple mistakes or forgetting things? These are signs of digital overload. Significant and growing research shows that too much digital stimulation can decrease the ability to concentrate, increase stress and anxiety, reduce productivity and disrupt sleep. 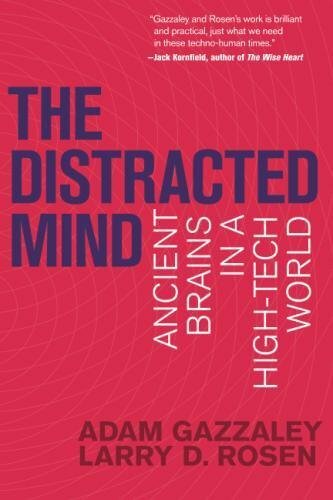 Research in digital distraction is increasing our understanding of how the brain processes information. Interestingly, multi-tasking is a myth. What we do is "task shift". We move our attention from one focus to another. This actually uses more attentional resources than maintaining attention on one topic and creates fatigue. It's far more efficient to focus on one matter at a time, finish it and move to the next. If you're experiencing digital overload, a digital detox is one way to give your brain much needed rest. A "pause" is important for memory, learning, and to reduce anxiety. You can "slow walk" your detox by taking small steps to limit digital intrusions. When you're ready for a bigger step, try unplugging for a half or full day. 1. Take "tech breaks": Begin reducing digital overload, by taking small breaks away from your smart phone. Set it on silent, put the timer on 15 minutes and place your phone face down. Turn off all computer alerts (including e-mail) and focus on something for 15 minutes. Notice whether you feel any anxiety that you cannot check your phone or emails during the break. Practice this daily. After you successfully complete the 15 minute break without anxiety, begin increasing this up to one hour breaks or more. 2. Turn off notifications on your phone and computer: Do you really need all those alerts? Your brain is hard-wired to respond to every alert. These alerts stimulate dopamine—a neurochemical that is part of the brain's reward system and is involved in addiction. Go through your phone and computer settings and turn off all non-essential alerts, including lights, sounds and vibrations. 3. Get physically active: Get outside daily and walk in nature or do a gym or home workout without being plugged into headphones—instead focus on the physical bodily sensations you experience and the environmental sounds around you. 4. Meditate: Practice meditation, mindfulness or deep breathing exercises. Start with as little as 2-minute breaks and work your way up to 25 minute sessions. Here are some simple 2-minute guided meditation breaks I've created for you. 5. Set specific times of day for checking email and social media and limit texting: Instead of reaching for your phone and automatically checking email or social media, select specific times of day. Similarly, do not read or answer texts immediately. Review those at designated times. At other times, let it be. You can access more peace and clarity for yourself by simply making a commitment once a week not to read or respond to emails, texts or any digital notifications (beeps, buzzes, etc). Keep in mind that each communication is an individual conversation. In reality, would you try to have 10 conversations at once? No wonder we're distracted! If you want to take it one step further, take a complete rest from the Internet and TV. Or, if you select programming, choose consciously regarding what energy you are exposing yourself—is it peaceful, informative, disturbing, positive or negative? Pay attention and notice how it makes you feel. 1. Pick a specific day and length of time: For example, I do this every Sunday. Respect the parameters. Notice if you have anxiety. 2. Inform friends and family: Tell people with whom you're in frequent contact that you will NOT respond to texts or emails during your detox. If you have many contacts, you can set an auto-response on your email to notify others that you will respond the following day. 3. Talk to people: Let others know that if they want to reach you, you can talk either in person or on the phone. Try face-to-face communication as much as possible. 4. Reflect: After you complete your time-out, notice how you feel. Discuss what the experience was like with a friend or family member or journal about it. Observe if you feel more calm and centered, sleep better or feel otherwise. After you try this, see if the benefits inspire you to continue. Technology provides powerful tools for daily life enhancement. Your mind, your heart, your vision of how you want your life's impact to be, however, is what gives these tools positive potential. For an introduction on how to increase mindfulness, check out the video below. Through this guided mindfulness exercise, I introduce mindful awareness. This exercise improves your attention and focus, and helps you to simply be in the present. By anchoring in your body and breath and focusing on what you experience with your senses in this moment—in each moment—this is how you start being mindful. Visit my YouTube channel for more helpful videos like what you've watched. While you're there, please subscribe. New videos are added on Thursdays. Join me in comments to share how you limit digital distraction in your life. If these tips helped you please LIKE below and SHARE with a friend.